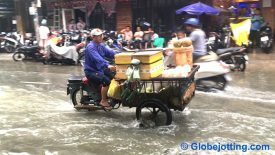 A motorbike with fresh coconuts for sale splashes through flooded Bùi Viện Street. 2016 has been one of the rainiest rainy seasons Saigon has seen in a long time. Making matters worse, unusually high tides have flooded streets in this low-lying city even when it wasn’t raining. Typical days see dry weather for much of the time, but sudden, heavy downpours seem to strike from out of nowhere. You never know when you might get caught in a deluge. With the motorbike being the preferred method of transport, people get soggy. I rode last Sunday to Bùi Viện Street, in the heart of Saigon’s budget traveler neighborhood, to watch game four of the World Series baseball championship. Afterward, I met my friend, Trung, for coffee. The morning started out dry, but then the rain came, hard and fast. The next thing we knew, the street was filled with several inches of water and we were trapped. After a couple of hours, the water subsided and I headed home to do some work. But in the evening, I went back to the street my forthcoming book is about to see if Halloween weekend would be as insane as I had heard it was. 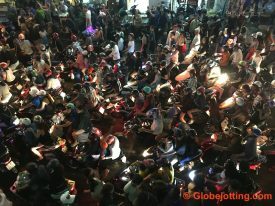 Saigon’s crazy motorbike traffic has become a bit of a travel writing cliché, but what I encountered when I arrived at the night-before-Halloween festivities was unlike anything I’ve ever seen. The streets were dry but there was a different kind of flood — thousands of motorbikes stuck in gridlock of unimaginable proportions. A Halloween traffic jam of horrors. I’m not sure what would compel anyone to drive into the fray to begin with, but once you were in it, it was impossible to turn around. There was no way out other than to inch your way down several blocks. Further clogging the street was a steady flow of pedestrians, who couldn’t walk on the sidewalks because they were clogged with tables, chairs, and … parked motorbikes. Worried about traffic (and knowing I would probably indulge in a couple of malty beverages), I took a xe om, a motorbike taxi, rather than driving downtown. As soon as I saw the Bùi Viện traffic tangle, I hopped off so my driver wouldn’t get stuck. That was my smart move. My dumb move was wearing flip-flops. My toes were in peril as I tried to squeeze down the street between slowly-rolling motorbikes. Mob psychology was taking over. Pedestrians and drivers alike were doing whatever they could to move another inch. There was shoving. There was honking. It’s the only time in Vietnam I’ve ever been worried about my safety. I managed to survive without any broken feet, however, and I shot some video of the craziness. Here are two one-minute clips. The first is at regular speed. The second is a series of three time-lapse clips of people on motorbikes and on foot trying to wiggle down the street. Want to explore Vietnam with me? I lead writing tours here and elsewhere on the planet. We’ll head out in search of adventures, and along the way, I’ll teach you how you can become a travel writer. Writers of all skill levels are welcome! Find out more here. Heh… I didn’t think I’d adapt to riding a motorbike through four-inch-deep puddles in this sort of traffic, but if you stay here long enough, it just kind of happens.